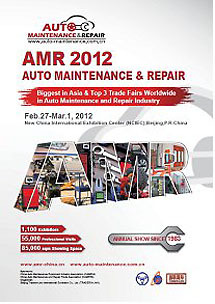 "AMR 2012 Auto Maintenance & Repair - Beijing - "ends with success. 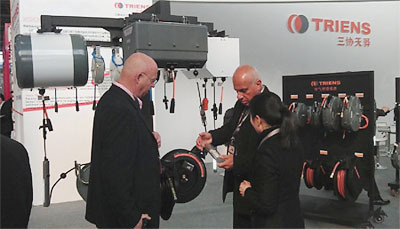 We TRIENS Sankyo Reels, Inc have participated in the AMR – auto maintenance & repair 2012 Beijing that took place from February 27th to March 1st. we are very pleased to announce that the exhibition ended with great success. As you may see in the picture of the exhibition center, the whole exhibition place was very bright and with sunshine that penetrates through big windows. We all felt very honored to receive so many clients who came from all over the world in such cozy and comfortable display room. We would like to address our thankfulness to all our customers again, thank you very much. 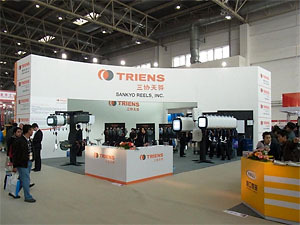 TRIENS group logos are on the wall of the booth, that express the global strategy of TRIENS Sankyo Reels, Inc. So many visitors dropped by our booth that the tables and chairs were occupied during all day long. The above id our unit box "SBB".that is popular in Chinese market. In the picture 8 units were united as reel box. Big and original, this product was the center of attention. Actually we aim to be the leader of Lube business in China just like we developed Reel business. Oil pumps that we just started to sell in China, attracted people’s eyes. Participating in exhibition is very hard for preparation and putting things in order. But at the same time it is very precious occasion for us to introduce and explain our products to customers. All of the staffs at our Chinese branch are very satisfied to have passed fruitful 4 days with customers at the exhibition, before getting back to Yancheng factory. If you have any questions on display products, or on our products uploaded on our website, please do not hesitate to contact us. We hope we could keep and even develop marvelous relationship we share with our clients.